Another meeting in Ladner means another opportunity to seek out interesting eats. Now, that is easier said than done. Generally, diversity in Ladner is equivalent to a speck of pepper in a bowl of salt. Other than a few Japanese restaurants, there is only singular (if that) representation of other ethnic food. I've already tried the sole Vietnamese restaurant here, so I thought why not try the only Indian restaurant as well. Located in a new development in quaint Ladner Village, Bombay Joes is a little place that serves up Indian food with a twist. Fortunately, I had eating companions this time around in Snake Eyes and Surfer Girl. More food to try and a little less conspicuous for my picture-taking. Surfer Girl and I arrived first. Since there was not a whole lot of time before our meeting, we ordered the food and Snake Eyes would just have to eat it. 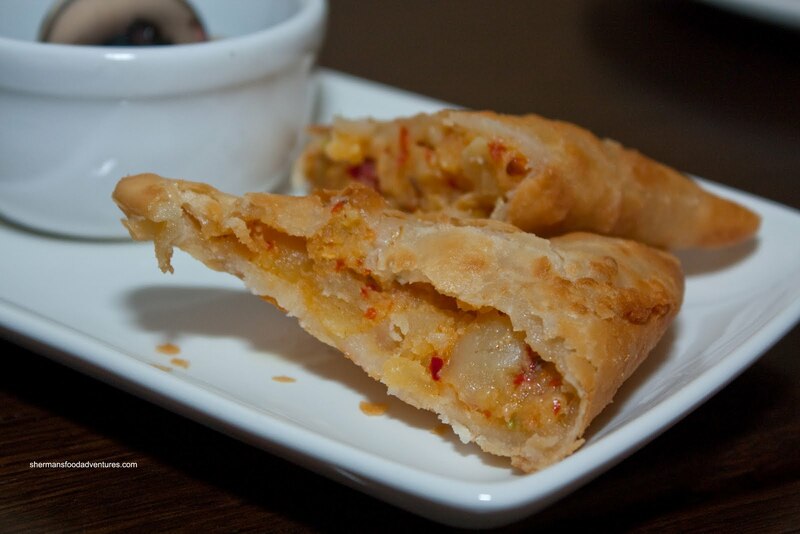 We started with a few appies with the first being the Samosa. Unlike the ones I normally snack on from the many places in Surrey, these looked more like turnovers. Appearances aside, they were pretty good. Like a turnover, the pastry was actually flaky as opposed to crispy. We liked the potato filling, it was far from bland being quite spicy. What really amped up the flavours was the wonderful tamarind sauce. It added a nice tart zing. 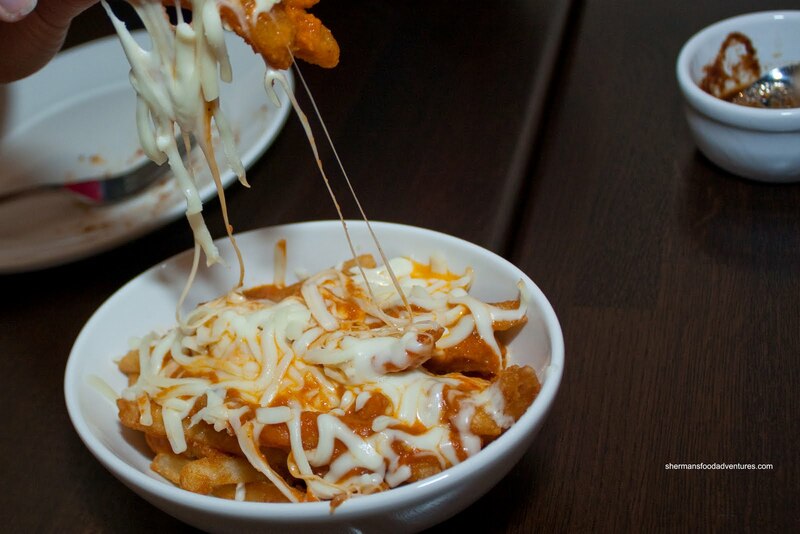 For me, one item really stuck out on the menu - the Butter Chicken Poutine. Now, I went in with reasonable expectations. C'mon, it's an altered French-Canadian dish served in an Indian restaurant. Just think how Hong Kong-style cafes butcher Western food (in a good way that is... sometimes...). So the fries were your typical frozen starch covered variety (seemed like Costco to me) and the cheese was just plain ol' mozzarella. So what needed to bring this together was the butter chicken sauce itself. And in this case, it delivered. The sauce was not overly creamy while still exhibiting elements of wonderful fattiness. Moreover it had a nice spicy tang that was quite well-balanced. In the end, it was fun to eat; but I'd stick with a regular poutine. On that note, the Butter Chicken itself was equally good, except there was big chunks of tender chicken. 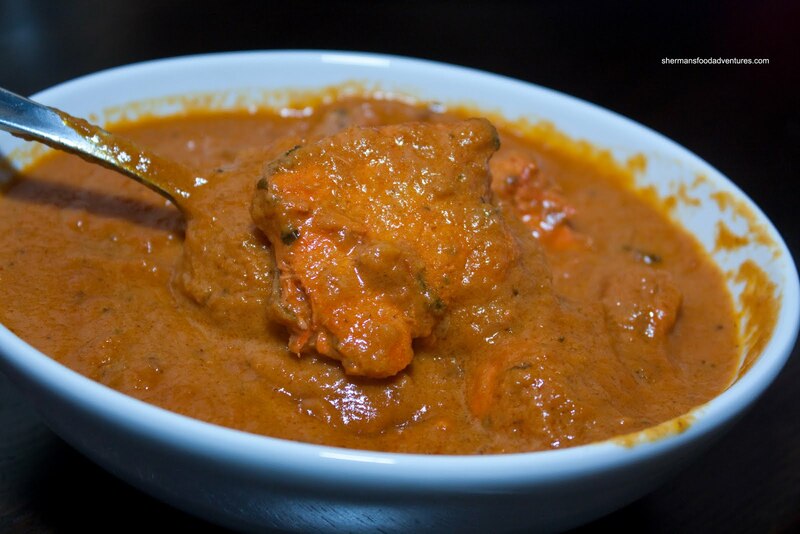 I personally like this style of butter chicken where it is creamy; but not in a way that it becomes mild. There was a nice balance of tomato, cream and spiciness. With every main entree, it comes with Roti. Normally, I much prefer naan since it is softer and more airy. 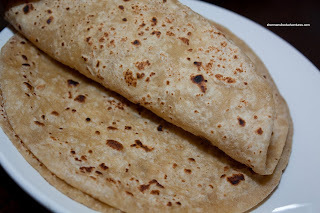 Seeing how roti is unleavened, it is naturally more dense. However, I found the roti here to be just slightly dense. It was quite easy to eat and I didn't miss the naan really. Well, we did get an order of Naan just to compare though. For once, I would've done okay without the naan and just stuck with the roti. 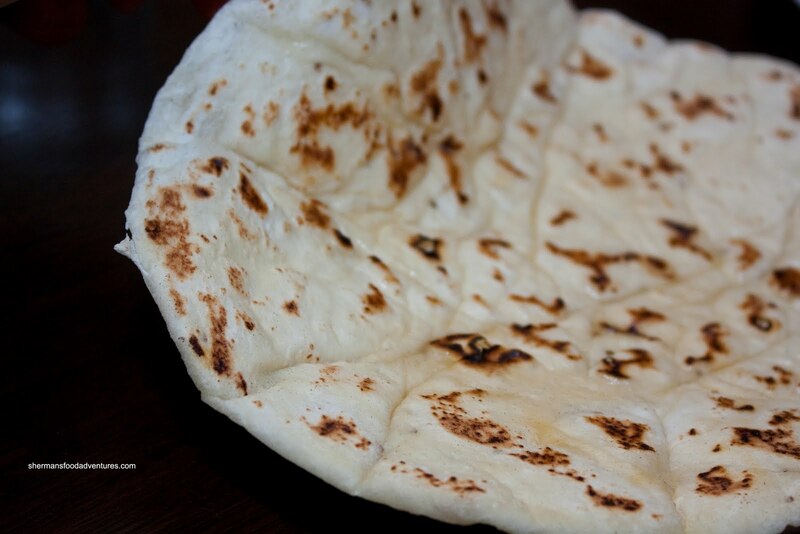 From its appearance, the naan looked "weak". It was pale and didn't exhibit much charring on the outside. Taking a piece to sample and it didn't get much better. It was indeed airy and almost fluffy; but that shouldn't be the predominant texture. It was too soft all around and needed more cooking on the exterior in a tandoor. I'm not sure if they have a tandoor on premises because the naan didn't look like it was prepared in one. For our next main, we had the Lamb Korma. 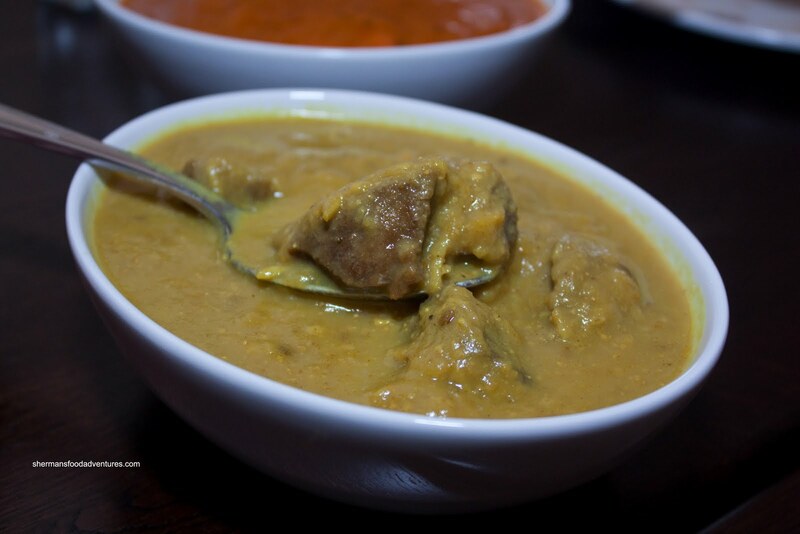 Normally, korma is one of the milder offerings and this one was no exception. It was so mild that not many of the usual flavours announced themselves. I'm not saying the korma wasn't good, in fact, it was more than acceptable. The lamb was mostly tender and not too gamy while the sauce was very creamy. It's just that none of the usual flavours such as the cashews jumped out at us. Lastly, I ordered the Cast Iron Chicken partly because it warned that it is "not for beginners". That almost seemed like an outright challenge! Apparently, in the description, it claims one must have a cast iron stomach to eat this spicy dish. Well, I hardly have a cast iron stomach; but I'm up to most spicy challenges. 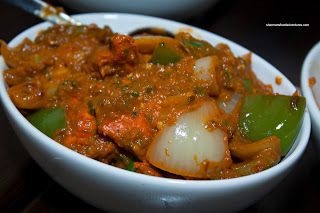 Looking much like a spicier version of chicken tikka, this offering was quite spicy. Now it wasn't blow-your-socks-off spicy; but I ended up eating it all since Surfer Girl and Snake Eyes backed off after the first bite. Not sure eating this entire dish was a good idea though since I had a hockey game later at night. Now I wouldn't want to pull a Luongo and take a "break" during the game... Well, to tell you the truth, it almost ended up that way. It really did a number on my stomach! TMI? Whatever the case, I really liked the spiciness. It wasn't spicy to the point that I couldn't taste the other flavours either, so this was a balanced hot dish. In fact, most of the food was pretty solid considering where this restaurant is located. 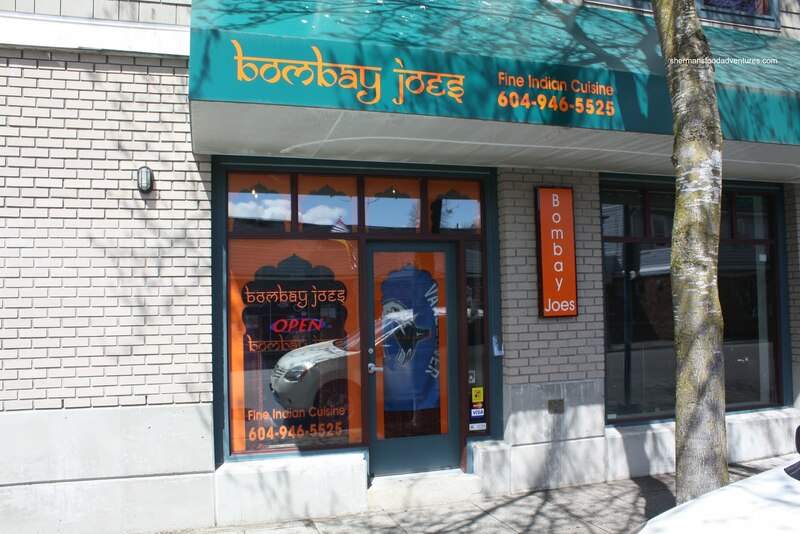 Besides, there is no other Indian restaurant nearby, so there really is no comparison.